The Early Textiles Study Group (ETSG) came into being in 1981 after a small group of people working with or researching into archaeological textiles started to meet together on a semi-regular basis to discuss their work and problems, to share knowledge and experience, and to advance their knowledge by visiting collections and exhibitions together. The number of those participating in the Group has grown gradually over the last decades. 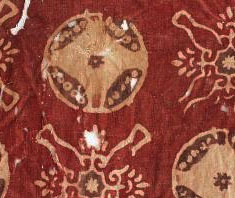 As well as those involved with archaeological textiles the ETSG now embraces specialists in fibres, weaving, textile techniques, dyes, conservation and modern analysis as well as embroidery, lace, leather and clothing. New members are proposed by two members at the biennial business meeting. Honorary officers as Chair and Treasurer were necessitated by the establishment of a deposit account for profits from conferences. The profits from one conference are used to get the next conference under way. The themed biennial conferences are open to anyone and have become established events in the textile history calendar attracting participants from all over Europe. Additional funding provided by the British Council and the Pasold Research Fund has also enabled guest speakers to be brought from many parts of the world.